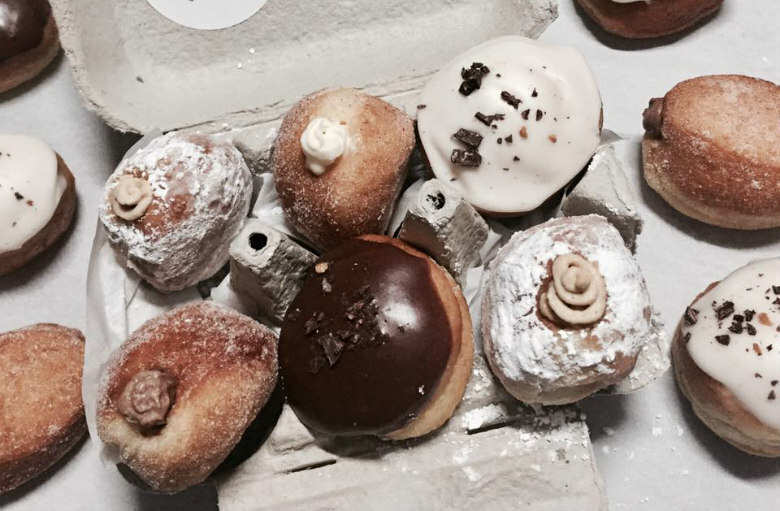 Is there anything more Seattle right now than a tiny-doughnut pop up inside a brewery? Side Hustle's doughnuts teeny tiny doughnuts come in egg cartons. I’m just gonna go ahead and call it: 2017 has been the Year of the Doughnut Pop Up. First there was Raised, upping the ante of what’s available in Seattle and selling out Every. Single. Time. The Flour Box does custom orders of General Porpoise-style filled doughnuts that look amazing, though I’ve yet to get my hands on any. (Not to mention this ingenious Mighty-O and Reuben's Brews collab.) And now, my heart officially belongs to Side Hustle. The latter of these, a Thursday through Sunday pop-up featuring doughnuts and cold brew, has been operating largely under the radar for the last couple of months out of Lowercase Brewing in Georgetown. “The primary idea came from the fact that breweries, much like coffee shops, are one-sided businesses, just at different times of the day,” says Lowercase owner Chris Smith. They already had a sweet, family-friendly set up, with plenty of parking outside and cozy seats inside. Why not utilize it? So his girlfriend Molly Crane started baking the most adorable little brioche doughnuts, made with a coarse flour she grinds from Lowercase's spent grain, and filling them with chocolate, coffee or vanilla custard, or topping them in dark chocolate, vanilla bean glaze or maple frosting. They’re so tiny—doughnut hole size, really—that they’re served in an egg carton for easy transport. A half carton is $4.50, a full dozen is $8.50. The plan is to expand what they're making with that spent grain flour—keep an eye out for waffles and such to show up occasionally on weekends. Along with the doughnuts, Side Hustle is using local cold brew coffee company Pier Coffee, served straight up or in a delicious horchata latte (with rice and almond milks and half-and-half) in 16-ounce mason jars. There’s a hot Americano available if cold brew isn’t your jam, but I strongly suggest at least trying it. The world of Instagramming foodies is already catching on to how delightful this place is—go now (Thursday and Friday, 7 a.m. to 10 a.m., Saturday and Sunday, 9 a.m. to noon). When I stopped by yesterday, there was no line, and I even left at 10 a.m. with some leftover doughnuts they were trying to get rid of. But Smith says they sold out every day last week. So know the competition could be fiercer by the time you’re reading this. And hey, if you like beer, go in the evening—even if doughnuts aren’t involved.